October 2, 2018, marked a very special day in QFLIP history. 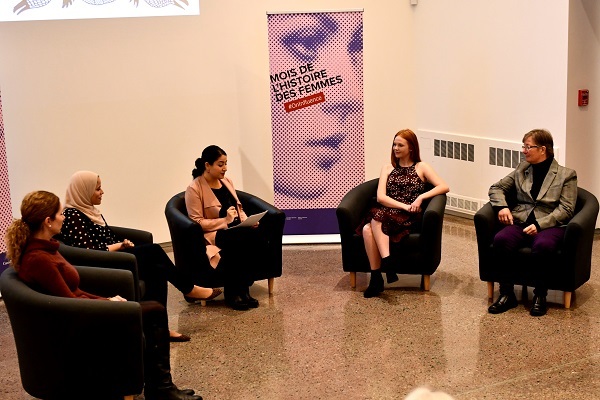 In partnership with the Ministry of Status of Women and the Honourable Maryam Monsef, QFLIP co-hosted the launch of the Women of Impact in Canada online gallery, coinciding with the celebration of Women's History Month. 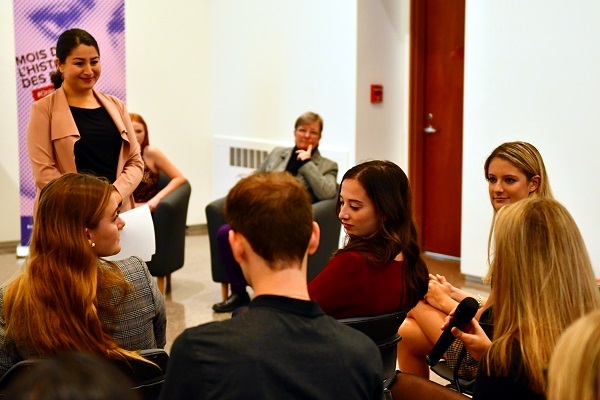 The event included a foreword by the QFLIP cochairs, a brief speech from the Honourable Ms. Monsef, the launch announcement, and a panel discussion at the Agnes Etherington Art Centre. The panel included Queen’s own Professor Elizabeth Goodyear-Grant (Political Studies Department; Director of the Institute of Intergovernmental Relations), Alaa Murabit (UN High-Level Commissioner on Health Employment and Economic Growth; certified physician), Faith Dickinson (Founder of Cuddles for Cancer charity), and Louise Fish (Director of Risk Management at Trent University; military trailblazer). The Women of Impact Gallery is part of a new initiative unveiled by the Ministry of Status of Women, which consists of an online gallery of photos, stories, and quotes from prominent Canadian women. The gallery inspired the theme for this year’s Women’s History Month, which is “Make an Impact”. Throughout the school year, QFLIP organizes after school club workshops with the YMCA to promote leadership and self care. 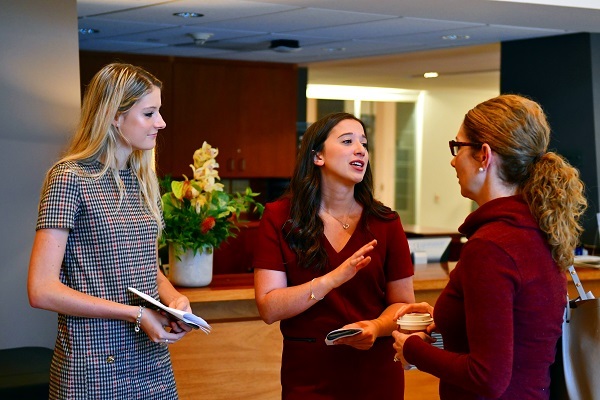 In April 2018, QFLIP partnered with Queen’s Project on International Development to facilitate a workshop focused on political leadership. At our very own QFLIP conference, we welcomed high school students from Toronto who got the chance to participate in panels and workshops and experience the conference as a whole. Do you run a girl’s or women’s initiative that could benefit from our presence? Reach out to our community outreach team to start a dialogue with us! In 2016 & 2018, QFLIP set up camp at University and Union on campus to learn what makes Queen’s students “QFLIP out!” – in other words, what gets them excited about women’s initiatives like ours, their favourite QFLIP initiative, their favourite female leaders, and other fun trivia. In 2017, we asked students on the Queen’s campus to let us know why they needed QFLIP in their lives, and what we mean to them. The responses got entered into a draw to win 2 half-price delegates tickets to the 2017 conference! QFLIP partnered up with Queen’s International Affairs Association to celebrate International Development Week by representing gender equality! We asked students on campus why gender equality matters to them, and got lots of thought-provoking and exciting responses. QFLIP-ers joined the QFLIP Executive team in September of 2017 to chalk the Queen’s sidewalk with some facts about female leadership, both on campus and globally! Since QFLIP’s founding, it has been present at the Queen’s in the Park event during Frosh week. We have a booth, music, and tons of enthusiastic exec out in the summer heat to engage with our incoming class about how they can become a part of the QFLIP family. Each year, QFLIP hosts a “taster” to invite students from across campus to get a sense of what attending the conference may look like. It has also traditionally been where we announce the theme for the upcoming conference. Stay tuned for this year’s taster to experience QFLIP firsthand!